How do I add new vaccination types, breeds or internal locations? How do I bring an animal back to the shelter after adoption, transfer or fostering? Where do I get some reports? Why am I seeing “animal not in location filter/site” when I open a record? Why is my animal marked not available for adoption? Why are my non-shelter and adopted animals appearing on the vaccination book? Why are my non-shelter and adopted animals being shown on my website? Why can’t I edit the date brought in field? Why can’t I view my person record? How do I integrate my adoptable animals with my website? I uploaded the wrong picture for an animal, but it’s “stuck”? Why do I get “page 1 of 1” in the header when I print documents? My scanned confidential documents are being published on my website / PetFinder! Why are ASM emails being sent from account@bounce.sheltermanager.com? Why has my colour scheme reset? If I delete a user, will it delete everything they created? Can I undo a CSV import? How do I export my data to shelteranimalscount.org? Go to Settings ‣ Lookup Data, and then choose them from the dropdown list at the upper right side of the screen. Open the animal’s record and go the Movements tab. Find the current adoption, transfer or foster movement, edit it and set a return date. Go to Settings ‣ Reports, then click the “Browse sheltermanager.com” button. 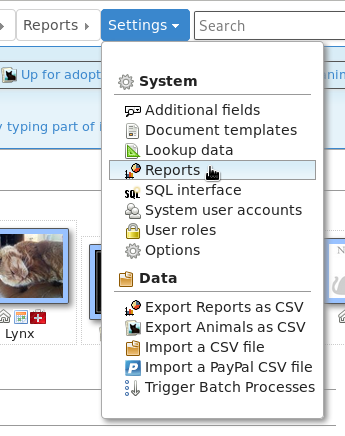 You can choose reports from the list and use the “Install” button to add them to your database. You’ve applied a “location filter” to your account. A location filter is a list of locations attached to a user account that prohibits the user from seeing animals who are not in one of those locations. To remove it, go to Settings ‣ System user accounts and remove the location filter items from your account. ASM assumes that any on shelter animal is adoptable, unless it has the “Not for adoption” flag explicitly set on it. There are then a set of rules applied to decide whether or not an animal is excluded from being adoptable. You can edit those rules under Publishing ‣ Set Publishing Options ‣ Animal Selection. The rules can exclude animals that don’t have a photo, are in a foster home or part of a cruelty case, are under a certain age, etc. If an animal is not adoptable due to any of those rules, when you view its record, you will see the words “Not for adoption” in the banner at the top of the record and directly underneath that in brackets the rule that has excluded the animal from being adoptable. The option Settings ‣ Options ‣ Defaults ‣ Include off-shelter animals in medical books and calendars controls whether or not off-shelter animals appear in the vaccination book, medical book, test book and are highlighted in alerts on the home page. By default, this option is off. You’ve likely set the “Courtesy Listing” flag for that animal. The purpose of that flag is to force animals that wouldn’t normally be adoptable to appear on websites and be sent to third parties for publicity. Common scenarios for this are non-shelter owned animals or previously adopted animals where the owner is handling the adoption, but the shelter is helping to publicise the animal. The option Settings ‣ Options ‣ Animal Codes ‣ Once assigned, codes cannot be changed will cause the edit animal screen to lock any fields that make up part of the shelter code. For example, if your coding format contains T for the type, the type field will be locked for editing when this option is on. If your coding format has any of YYYY, MM or DD for a portion of the date brought in, that field will be locked too. You’ve linked a person record to your user account. This should only be done when you want to forbid a user account from viewing a person record and is there to prevent staff members from editing their own person records. You can unlink the person record by going to Settings ‣Edit System Users, editing your user account and using the trash can icon to the right of “Staff Record” to break the link. Breaking the link will not delete the person record or user account. See Appendix: Integrating with Your Website. Your browser caches the thumbnail images for each animal. If you upload the wrong picture, then delete it and upload the correct picture your browser will continue to show the old picture. To fix this, invalidate your browser’s cache when looking at the animal’s record by pressing CTRL+R or F5 to reload all images from the server. This does not work as well in some versions of Internet Explorer and if you are using that, you can try Tools ‣ Internet Options and delete temporary internet files. Firefox: Choose Page Setup from the File menu (press ALT if it is not visible). Click on the Margins & Header/Footer tab and choose –blank– from all the dropdowns in the Headers and Footers section. Chrome: Untick the “Print headers and footers” box in the print preview screen. You’ve attached scanned documents as JPEG images to animal records. You should NEVER do this! They can be published outside the shelter, which you do not want. They aren’t relevant to someone browsing an animal bio online. ASM scales down incoming pictures for the web, assuming any pictures you upload are always going to be photos of animals. This means smaller text on documents you scan as JPEG will become unreadable. Instead, you should always attach your scanned documents as PDF files. ASM scales PDFs in a different way so that they don’t lose clarity and legibility, it will never publish a PDF to any website. If you’re using phones rather than flatbed scanners to scan your documents, apps exist for all mobile platforms that allow you to take a photo of a document, clean it up and output it as a PDF. Apps such as “CamScanner” for Android, or “Scanner App” for iPhone. In the early days of email, address spoofing was used by everyone. It was an easy way ensuring an email came back to you no matter what servers your message passed through. Unfortunately, this also made it easy for spammers to fake where their emails were coming from and to send a lot of backscatter (failure notices) to innocent victims. Most large email services today, such as gmail, hotmail and yahoo use technologies called SPF and DKIM. These allow a domain to state which mail servers are allowed to relay email on its behalf. For example, the hotmail.com domain states that nothing but the hotmail servers are allowed to send any messages that come from a hotmail.com address. When a message arrives at an email server using these technologies, it checks the domain the email is from and then checks to see whether the server it received that message from is allowed to send email for that domain. If it isn’t, the message is put straight into the spam folder of the recipient or in some cases, rejected outright. This is very helpful in filtering spam, but it means that ASM cannot send emails that appear to come from your address (particularly if you have a hotmail or gmail address) - otherwise most mail services will either refuse delivery of your message or put it straight in the spam folder for the recipient. Instead, ASM sends emails from the fixed address you configured in sitedefs and trusts you know what you’re doing. sheltermanager.com sends emails from a account@bounce.sheltermanager.com address. Your real email address is set in the Reply-To email header, which email clients will honour when someone replies to your message. So while they’ll see the message as appearing to come from account@bounce.sheltermanager.com, when they hit the reply button in their email client, the email they create will have a to address of you@youremail.com instead. In the case of sheltermanager.com, if someone does accidentally reply to a account@bounce.sheltermanager.com address, the sheltermanager email server will find your account and send the email through to you, or find a Reply-To header in the quoted message if one exists and send it to that. What users see on screen when they start using ASM matches the screenshots in the documentation and help videos. The system now follows the law-of-least-surprise as users will only ever see the theme they’ve chosen themselves and others can no longer change it for them. All users can choose their theme/colour scheme by clicking on their username at the top right, and then the “Change User Settings” menu option. No. You can safely delete user accounts and it will not delete any data. 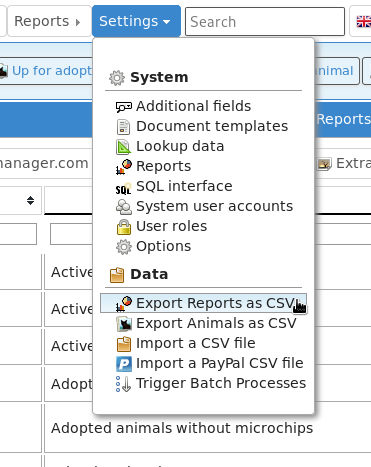 There’s a special report that will export your monthly figures to shelteranimalscount.org for upload via their CSV import tool. 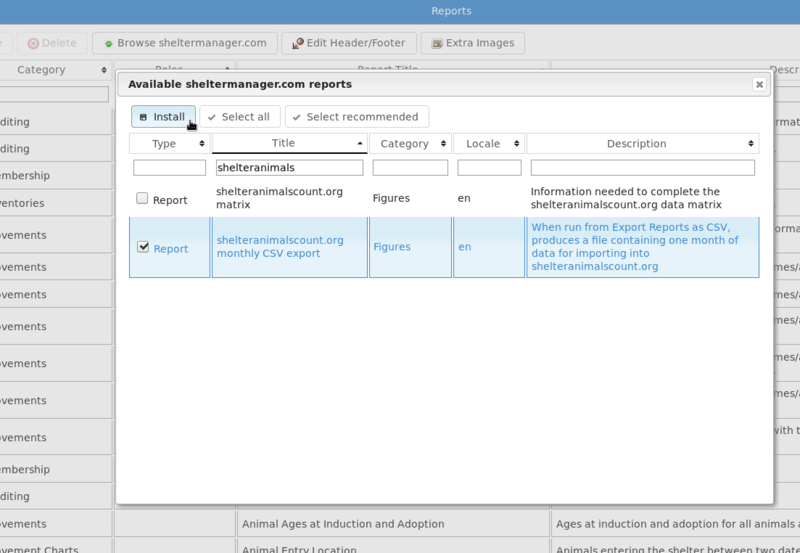 Use the “Browse sheltermanager.com” button to install new reports. Enter part of the name in the search box at the top of the title column, select the report you wish to install by ticking the box to the left of it and clicking the “Install” button. Finally, enter the start and end dates of the calendar month that you’d like to generate the figures for. The report will only work correctly for one calendar month. Run the report multiple times for multiple months.